President Trump gave a speech Tuesday night to a joint session of Congress and many guests. This was the constitutionally mandated State of the Union report: “[The President] shall from time to time give to the Congress Information of the State of the Union.” In modern times, this has come to mean an annual (except for a president’s first year in office) live address, in January or February. SOTUs have become events of great political pageantry. They are an opportunity for presidents to announce new policy initiatives and lay out their plans to achieve them. 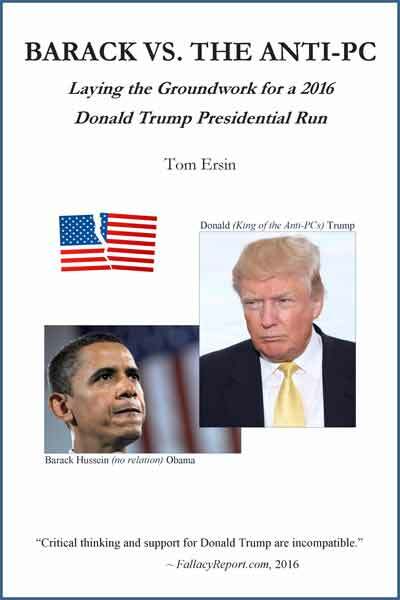 Presidents also use them to offer a compromising tone to the opposing party who might have regained control of one or both chambers of Congress in the last election. In the President Donald J. Trump era, however, the State of the Union address has become almost meaningless, except to examine stakeholders’ (political leaders, party factions, advocacy groups, and pundits) reactions — and to see if Donald’s speech-reading skills have improved. He offers no policy specifics. He offers only trifling, hypocritical sentiments of compromise. Words from the mouth of Trump have lost all credibility, especially Teleprompter Trump. Donald lies, obfuscates, and evades in whichever form of communication he participates. Almost everyone accepts that, including most of his allies (who believe he’s justified in lying for the cause). But Teleprompter Trump is reserved for the most obsequious of platitudes and phony feel-good declarations — to which Donald obviously does not subscribe — though he wants us to think he does — because he thinks we think he’s supposed to. No, “victory” for Donald has always been winning for Donald. If it happens to be good for the country, too, bonus. OK, that’s some decent alliterative effect from the speechwriters, but the content is galactically hypocritical and void of meaning coming from this president. (“The food at that restaurant is terrible — but they give you large portions.”) Donald Trump is the epitome of “revenge, resistance, and retribution.” The only hope that he ever will “embrace the boundless potential of cooperation, compromise, and the common good” will come when Don Jr., Ivanka, or he is on the verge of donning a prison jumpsuit. Who wrote this pabulum-alicious crap!? That’s enough of the cutesy alliteration. Now it’s nauseating. In Stephen Colbert’s immediately legendary live monologue right after the SOTU and obligatory pundit analysis, he continued Donald’s farcical juxtapositions: “… greatness or gridlock, results or resistance, vision or vengeance, soup or salad, paper or plastic, Ross or Rachel, Alien versus Predator …” Nailed it. Here’s the thing about the Trump boom. First, it’s a continuation of the solid upward economic trend that President Obama set the country upon after saving us from a second Great Depression in 2009. All Donald had to do was not screw it up. Any financial benefit from Trump’s heralded rollback of regulations is more than negated by the damage caused by these rollbacks. Funny thing, Donald: our children might want to breathe clean air, drink clean water, and live in a Florida or California not permanently flooded or incinerated due to climate change. Families might want to be free of predatory credit card, payday, and student loan lenders. Workers might want to know that their health and safety is not endangered in production facilities and steel yards. People are funny like that. Second, your “massive tax cut for working families” is widely acknowledged to have been a giant gift to the 1 percent and corporations. The crumbs you threw to working families barely buy an extra case of Bud Light each payday to drown the misery of living under your presidency. And remember your phony promise of a legitimate middle-class tax cut you made just before the 2018 midterm elections? That drifted off into the ozone-damaged sky after your Grand Old Party was creamed and crushed, decimated and dominated, subdued and subordinated, shellacked and schlonged — Is that enough annihilating alliteration for you? Third, your “massive tax cut” drove the national debt up from $19.9 trillion when you took office to $22 trillion today. Sure, Democrats have contributed to the original $19.9 trillion. But when they did, Republicans called them communists, socialists, and, even worse, spendthrifts. But you, Mr. Trump, exploded the debt by 10 percent in two years — after promising to eliminate it — and most of us have received little or no benefit. More women in Congress? Now there’s a development for which Trump honestly can take credit. In widespread opposition to his policies and character, women were elected to 35 of the 40 new Democratic seats picked up in last year’s midterms. Of the 36 women newly elected, only one is Republican. A record 102 female representatives serve in the 116th Congress, of which, 89 are Democrats. In direct contradiction to Trump’s claim, it was Donald’s 2017 Twitter-threats aimed at Kim Jong Un that significantly increased the odds of a military conflict with North Korea. The U.S. president’s own generals were aghast. Trump backed off the threats, Kim settled down, and the tensions subsided. This is what the president calls avoiding war. Meanwhile, Kim Jong Un continues to strengthen his nuclear capabilities. Donald continues to assure us there is “no longer a Nuclear Threat (sic) from North Korea” (Twitter; 6/13/2018), but this declaration is disputed unanimously and vigorously by his own military-intelligence community. Trump loves to introduce paper bogeymen: migrant caravans, Mexican rapists, Sharia law, MS-13 gangs, Antifa, Democrats, and now socialism. No one of any importance is making “new calls to adopt socialism in our country.” Two or three well-known politicians do call themselves “democratic socialists.” Thinking people know they don’t represent traditional socialism. These democratic socialists support a form of social democracy that includes policies such as universal health care and subsidized college for working families. Spare me. More Trumpian pabulum. Got that, Congress? If you investigate me, I’ll trash the economy. If you investigate me, I won’t sign any legislation. If you investigate me, our foreign enemies will defeat us. 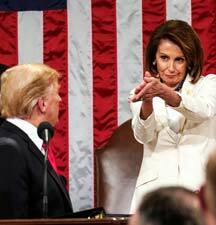 Funny thing: House Speaker Nancy Pelosi (D-Calif.) is not moved by Donald’s threats. Pelosi has Trump’s number. She knows how to get under his skin — in a good way — that’s right for the country. The president is afraid of her, and should be. Nancy is the only political adversary for whom he has not coined a derogatory nickname. As a measure of how un-seriously Democrats take Trump’s threats, in the two days after the SOTU, House Democratic committee chairs fired up oversight efforts that the last Congress’ Republican leaders quashed for two years while they were in charge. They reignited the Trump-Russia probe. Rep. Adam Schiff (D-Calif.) issued a statement announcing his House Intelligence Committee would begin scrutinizing “credible reports of money laundering and financial compromise” within Trump’s businesses and presidential campaign, transition, inauguration, and administration. The House is scheduling oversight hearings on presidential tax returns and migrant family separations. It is preparing to hear testimony from acting Attorney General Matthew Whitaker, Trump former attorney-fixer Michael Cohen, and others. It is drawing up subpoenas. It voted to release 50-plus congressional testimony transcripts to Special Counsel Robert Mueller so he can pursue possible perjury charges against certain Trump World actors for lying to Congress. How did this one sneak in here? This quote is not from Donald’s State of the Union address Tuesday night. It’s from President Richard Nixon’s (R-Calif.) State of the Union address in 1974, just several months before he resigned to avoid inevitable impeachment and conviction.